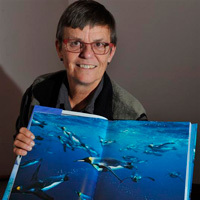 Tui De Roy is a world-renowned, award-winning wildlife photographer and writer, as well as an acclaimed conservationist. 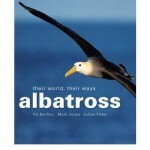 Her work has been published in over 40 countries, with seven large-format books on Galápagos, plus others on the Andes, Antarctica, New Zealand, the world’s albatrosses, and penguins. A self-taught naturalist, Tui has spent most of her life in the Galápagos Islands (her family having moved there when she was two), leading a pioneering lifestyle. By her formative teenage years Tui was spending much time in the company of scientists in various fields of Galápagos research, both learning from them and sharing her own intimate knowledge of the islands. Later she became the first Galápagos National Park licensed naturalist to serve the budding tourist industry (in the mid-70’s). She is an active member of the Charles Darwin Foundation general assembly, and served on its board of directors. Although now living in New Zealand and traveling widely in pursuit of images of rare species and faraway places, Tui returns to Galápagos often, working tirelessly to promote their preservation and continuing her photo documentation in close association with the Galápagos National Park. 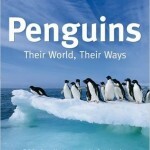 Many of the extraordinary facets of penguin life are only just being revealed, and Penguins: Their World, Their Ways is the first book to comprehensively cover all of the 18 penguin species in an engaging blend combining accessible writing, the latest scientific research and over 400 great photographs.